When I was working on the present essay, the third part of a series, Russian ambassador Andrei Karlov was killed by Mevlüt Mert Altıntaş, the police officer of Ankara Riot Police, in an exhibition opening. In this essay, leaving aside the humanitarian and political complications of this sinister event, I would like to think about Burhan Özbilici's photograph which haunted us as it has recurrently appeared in social media. A lot of discussions were made regarding the photo of Altıntaş taken after the shooting as to how clear and striking it was. It is crucial that Özbilici, with his sense of mission and determination, recorded this historical moment. What strikes me the most is productional significance of Altıntaş's body, poise and clothing – Altıntaş who is the protagonist of the photograph (I focus on the photography, for I refuse to propagate and take for granted the violence embraced by the video). I argue that the pose here is not one that had been rehearsed; it is a pose which we, as an audience, have internalized as part of the notion of heroes and villains. Susan Sontag, in Regarding the Pain of Others, points to the fact that eyewitnesses to the events of September the 11th describe what they experienced as "a movie." This is one of the soundest descriptions about the event which we did not realize back in 2001, but now know to be against specific symbols. If we are to assume that movies decipher reality through representation, it is plausible to think that terrorist organizations hinder the conception of reality and use similar strategies in order to transform reality in new and insecure ways. Bringing down one of the main elements of New York's silhouette, the center of free market economy which is the symbol of American society in ruins is an indicator that the aim was one of redefining the notion of terror and danger, rather than killing people. What has changed in 15 years is that major "spectacular" mise-en-scenes gave way to (anti)hero portraits. Some assumed that Altıntaş's iconic photograph was a performance. It occurred to no one that this brave guy could be an assassin who remained in the crime scene to give his message, maybe because photographs circulate more than the news themselves, or maybe because we have taken for granted the fact that art galleries are places where we see things overstepping the limits. The key to Altıntaş's pose was a prologue to homicide, his message which he thought he could not publicize otherwise. The dead guy was a symbol, the transgression of violence was a tether, and the focus was to give a message which cannot be conveyed otherwise publicly at that specific moment. 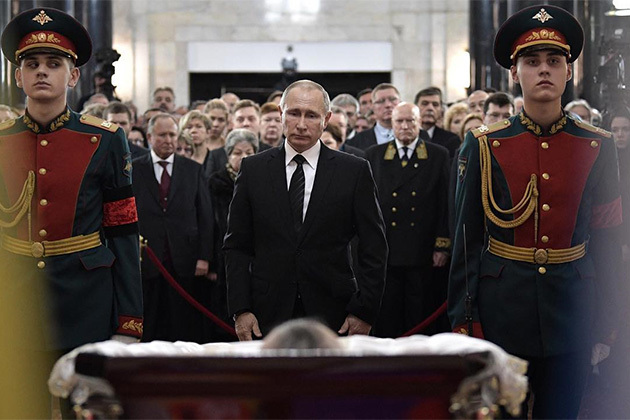 The expression on Putin's face, a combination of pain, affection and despair in the photo which can be described as the "last gaze" where Putin is looking at the open coffin, is another example of this issue of messages that cannot be conveyed otherwise. The helpless, bitter leader in this photo which was "disclosed" to the press is a mourning figure who has regained his humanitarian face. In these days where mourning is a luxury, Putin's image becomes a mourning icon. 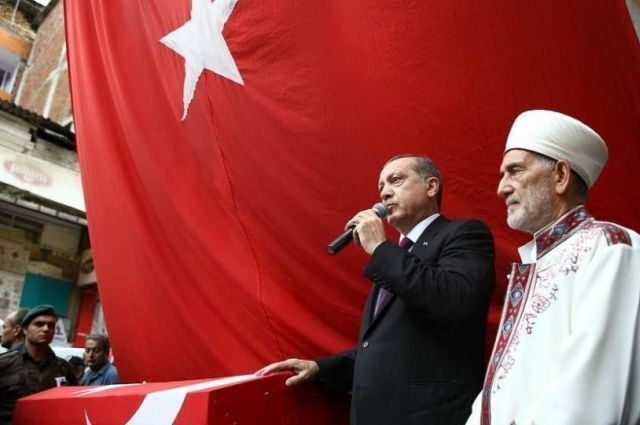 Another image of "martyrdom" dated August 17th, 2015, is sadly the photo where the president puts his right hand on the martyr's coffin which was covered with the Turkish flag and making a speech with the microphone in his left hand. In this photo where we see the seeds of this ambiguous relationship between shahada and politics were sown in January 2017, where political power comes from became materialized. Power comes from the coffin itself. The body inside the coffin becomes a tool transcending the human life lost. When Antigone is protesting against her uncle Kreon who refuses to bury her brother Polyneikes' body, she advocates that the dead have a right to be buried properly for the life after death. Even if the possessive tyranny of Kreon which extends to life after death seems like a conflict between law of nature and positive law, is in fact an example of the politics of the dead. When can bodies be left alone? Who can lay a claim for the dead bodies that no longer speak an intelligible language in our world? Elias Canetti, in Crowds and Power writes: "…seizing and incorporating…There is nothing about us which is more strongly primitive." The power derived from others' pain and sorrow by today's global phenomena, (paranoid) authorities, is fatal not only because it is primitive, but also because it has the potential of filling the gap left by loss. In this war of symbols where delicacies and nuances are withering away, people participate in politics after they become dead bodies. Or with his nails he'll dig it up again! With these last lines which engulf and unsettle the reader, what Eliot does is something we should also do as people who are looking at these photographs and seeing different phases of violence: to acknowledge our agency in those moments where we are engulfed and pacified.